Applying our engine Protein Macroarrays, protein interactions with many types of molecules can be investigated. Since the immobilization takes place under denaturing conditions, engine Protein Macroarrays consist equally of conformational as well as linear sequence epitopes. This makes engine Protein Macroarrays ideally suited for epitope mapping, antibody cross-reactivity screening and auto-antibody profiling. Additionally, engine Protein Macroarrays can also be used for the identification of DNA/RNA binding proteins or for functional assays, such as phosphorylation, methylation or ribosylation studies. 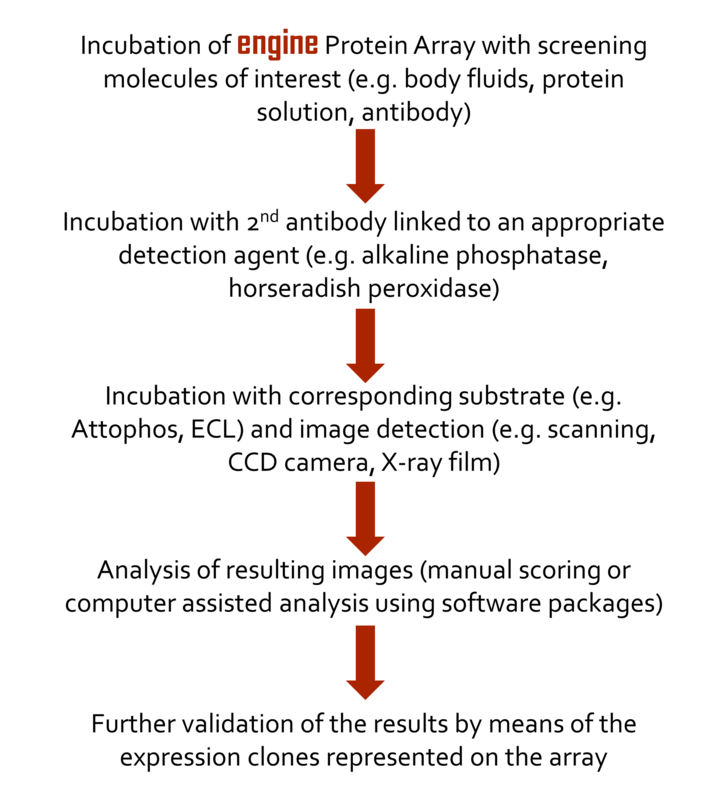 The analysis of engine Protein Macroarray screening experiments can be done either manually or with dedicated array handling software. A general setup of a screening experiment using antibodies is shown below.